Great Opportunity is knocking! Day after Tomorrow, 15th October 2013, InshaAllah, would be the 9th day of Dhulhijjah, which is the Day of Arafah. Don't miss it! Do Fasting! Grab the Opportunity and Get Fabulous Reward, InshaAllah! Fasting on the day of ‘Arafah is a confirmed Sunnah for those who are not performing Hajj. 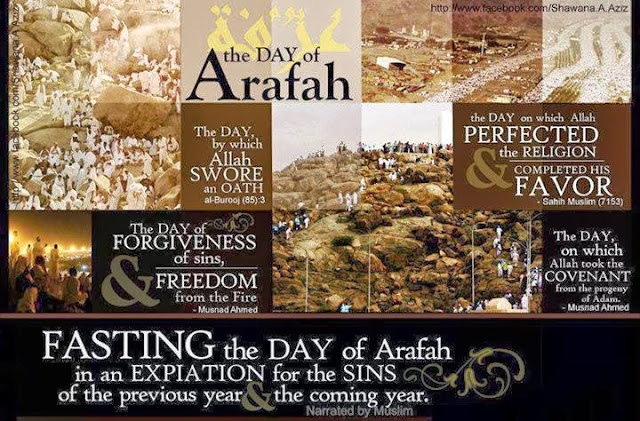 Abu Qatada al-Ansari (Allah be pleased with him) reported that the Messenger of Allah (may peace be upon him) was asked about fasting on the day of Arafa (9th of DhuI-Hijja), whereupon he Peace be upon him said: It expiates the sins of the preceding year (a year before) and the coming year ( and a year after). Urdu Translation: Hazrat Abu Qatada al-Ansari Radi Allahu Anhu se rivayat hai k RasoolAllah Sallallahu Alaihi Wasallam se Arafa (9th of Dhul-Hijja) ke Rozey ke baarey mein pucha to Aap Sallallahu Alaihi Wasallam ne farmaya Ye Aik saal Guzrey huye aur Aik saal Aagey Aaney wale (Gunaaho ka) ka kaffara hai.